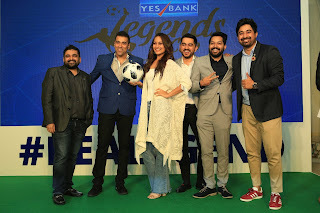 Mumbai, October 9, 2018: YES BANK Legends Cup, India’s largest corporate football tournament organized by Footplay Sports today announced a brand-new edition to take place across six cities from October 2018 to March 2019 in presence of Bollywood star Sonakshi Sinha, model actor Nora Fatehi, actor, VJ and Footplay Sports’ Rannvijay Singha among many others. They also announced LaLiga coming on board as their global football partner. This will give the Winning Team from the Legends Cup tournament an opportunity to go for a LaLiga experience in Spain. YES BANK Legends Cup tournaments fourth edition will travel across Mumbai, Pune, New Delhi, Bengaluru, Kolkata and Hyderabad. There will be over 600+ teams across approximately 6000+ players from India’s biggest corporate houses participating from all the cities. The tournament also has a 70:30 ratio of men and women. The number of participation from women is growing with every edition. The mix of participants includes CXO’s, senior executives and young professionals with majority participation coming from C-level.